One of the most challenging enterprises in the field of intercultural dialogue is the translation of a masterpiece. Rarely, one adequately translates a book of great importance into another language. We should respect a brilliant Scottish sinologist James Legge, who enthusiastically translated the Chinese Classics into English. We should admire great Kazakh poet Abai, who marvelously interpreted verses of Russian genius Alexander Pushkin, whose poetry has very few successful translations worldwide. The outstanding translators did their wonderful translations directly from original works of literature. That is why the translations themselves became literary monuments. However, when one translates a piece of literature not from the original, then you cannot hope for exceptional results. 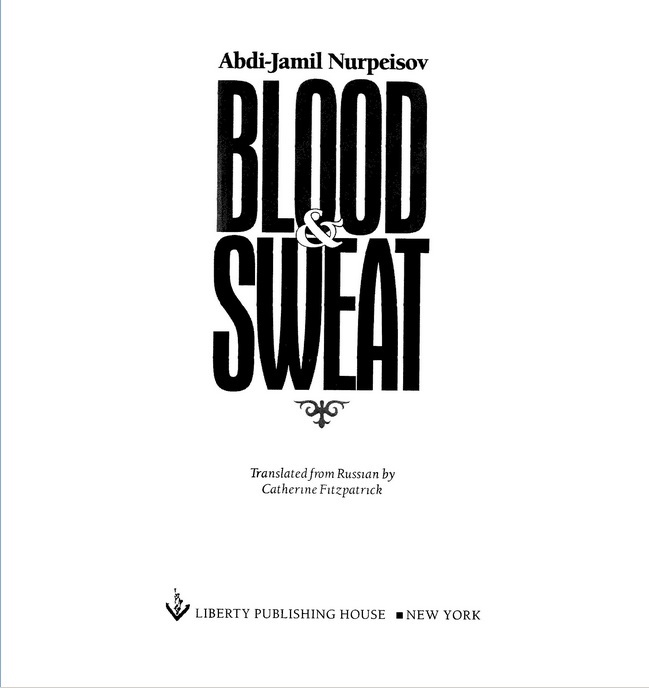 In 2013, Liberty Publishing House, New York, published a novel Blood and Sweat by Kazakh writer Abdi-Jamil Nurpeisov. Catherine Fitzpatrick translated it from Russian, not from the original Kazakh text. Well, you could translate a financial document without much attention to whether it is original text or translated one, because all you have to do is just to recapitulate some facts and concrete data. No subtleties of psychological portraits, peculiar idioms of alien tongues, or magnificent landscapes. Thousands of Kazakh native speakers have fluent command of English. Certain Anglophone scholars speak Kazakh. Therefore, the publishers could have found one way or another to carry out a decent direct translation. Nevertheless, they preferred to make a fast buck, rather than meticulously interpret a great Kazakh novel. No wonder that the indirect translation is fraught with deplorable inaccuracies. For example, the very first lines of the novel were misinterpreted. The Kazakh original read as follows: «– Бетім-ай! Масқара-ай! Тырыли арық Қарақатын жерқазбаға танаурап сөйлей кірді. Құшағындағы отынды аласа қазандықтың жанына аудара тастады» («What a shame! pantingly said lean Qaraqatyn, entering the dugout. She heaped an armful of the firewood by the low cauldron holder»). Diligently translating the Russian translation of the Kazakh original, Catherine Fitzpatrick wrote the following: «Panting, lean and excited, Karakatyn ran into the zemlyanka. Trowing (sic!) down a handful of crooked branches by the little stove…» In this telltale example, the translator mistakenly transcribed even the female name, Qaraqatyn. The point is that an English letter Q must transcribe a Kazakh uvular consonant Қ in «Қарақатын». Thus, it must have written as «Qaraqatyn». However, the translator carefully transcribed the Kazakh female name from its Russian transcription, which turned the uvular consonant into a velar consonant К, much more convenient for Russian speakers.